The Department of Agricultural Sciences aims at achieving excellence in academics and research. Bachelor’s and Master’s courses in Agriculture are offered by Department of Agricultural Sciences. The Department offers four years course in B. Sc. (Hons.) Agriculture and two years Masters programme in Vegetable Science; Genetics & Plant Breeding and Plant Pathology. The Department has designed dynamic and focused curricula as per the guidelines of Indian Council of Agricultural research (ICAR) to develop well-trained manpower for academics, agro-based industry and extension oriented applications. 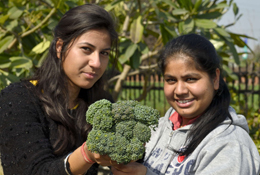 For agriculture courses, DAV University in Jalandhar is the best University. Department also focuses on inculcating the ethical and moral values in students. Students are motivated to interact with the farmers and participate actively in seminars, symposia, conferences and workshops. The thrust areas of the department include multi-disciplinary research in the fields of agriculture and its allied ventures. The department has eminent and highly qualified faculty with Doctoral and Post-Doctoral research experience in the current areas of Agriculture and allied Sciences. Research projects funded by Department of Science and Technology, government of India are in operation in the department. The Department is well-equipped with spacious classrooms and laboratories to provide quality teaching and research opportunities for the students. The students are also imparted training in the field through conduct of research trials and demonstrations.